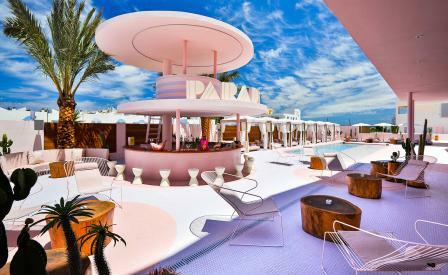 Madrid-based Italian studio Ilmiodesign has transformed a previously functional 16-year-old block of holiday apartments, in Ibiza’s San Antonio district, into an art deco-style building that now houses the new Paradiso Ibiza Art Hotel. Recalling a kitsch and colourful 1970s Miami, the firm incorporated cantilevers, curve-edged balconies and vertical fins into the building’s façade, which is now washed in a showy pink. On a mission to boost contemporary art in the San Antonio neighbourhood, are Spanish artists Iñaki Domingo and Diana Kunst, who are leading the hotel’s art programme. Acting as curators and advisors, the pair have sourced approximately 60 local and international artists – including Marcos Torres (Ibiza), Pau Sanz i Vila (Alicante), Thani Mara (Barcelona), Yoko Honda (Japan) and Marylou Faure (France) – to display various works throughout the property. They have also curated a mini-library of art books and will host residencies and workshops for local artists, some taking place in the Zero Suite, a fully-furnished glass-walled bedroom installation on display next to the reception area.